This story was updated at 4:13 p.m. EDT. Sen. Lisa Murkowski said today that a tense phone conversation with President Trump earlier this week led to yesterday's call from Interior Secretary Ryan Zinke, who reportedly told both Alaska GOP senators that the Energy and Natural Resources chairwoman's vote against the motion to proceed to the health care debate would influence the administration's resource development policies in the Last Frontier State. 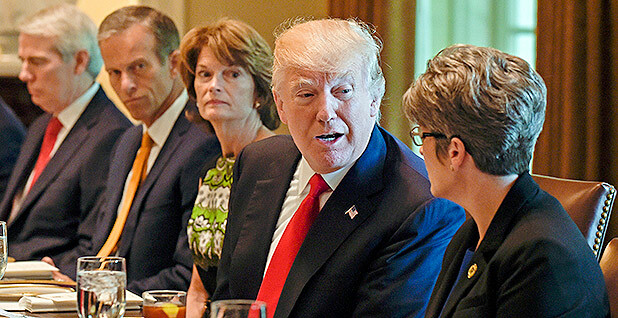 "It was not a very pleasant call," Murkowski told E&E News of the Tuesday conversation with Trump, in which the president urged her to back the procedural health care vote. "It was a hard call." She said she and Trump have a "simple disagreement" on health care. "What we're dealing with here is the president and I agree that the status quo when it comes to health care doesn't work and we've got to do something about it," she said. "Where we disagreed was on the process and whether or not the Senate was ready to go to the floor." Along with Maine Republican Sen. Susan Collins and every Senate Democrat, Murkowski voted against the motion to proceed to health care legislation Tuesday, forcing Vice President Mike Pence to step in and cast the tiebreaking vote to launch debate. That prompted an angry tweet from Trump yesterday morning. Murkowski "of the Great State of Alaska really let the Republicans, and our country, down yesterday. Too bad!" Trump tweeted. Both Murkowski and fellow Alaska Sen. Dan Sullivan received phone calls from Zinke later in the day. Sullivan told the Alaska Dispatch News that Zinke delivered a "troubling message" that Murkowski's "no" vote would have ramifications for their state. Murkowski today said she didn't know the details of Zinke's call with Sullivan and declined to say whether there were implied threats of retribution for her health care vote. "I don't want to go into the contents of a personal call, but it was a difficult call, let's just say," she said. But Zinke "basically said the president is really disappointed in what he perceives to be as your lack of support for health care reform," she said. "And again, the president and I are not disagreeing on the need for health care reform; where we're disagreeing is on the first step that was taken this week. So we'll move forward from here." The health care tension threatens what otherwise has appeared to be a positive relationship between Murkowski and Zinke, who declared Alaska "open for business" during a visit over the Memorial Day recess (Energywire, June 1). Murkowski said she believes that visit made a lasting impression on Zinke. "I don't want to put words in his mouth, but he was very taken by what he saw in Alaska and the opportunities and the realization that as secretary of the Interior, he can do great good for not only Alaska, but for the country," she said. "And I know that he was enthusiastic about it and still is enthusiastic about it. "So how we go about accomplishing good things for the state but accomplishing good things for the country — this is what we're going to do together. And right now, the president expressed his disappointment, and what I'm going to do is continue working in good faith with everybody on everything." The Interior Department did not respond to multiple requests for comment. The phone calls came the same day that the Energy and Natural Resources Committee abruptly postponed a vote scheduled for this morning on several Energy Department and Interior Department nominees, saying only that the hearing "has been postponed until a date and time to be determined." Murkowski sidestepped a question on whether the postponement was related to the phone call. "In fairness, there was an issue that had arisen with one of the noms, and we were going back and forth should we delay, but the decision was made yesterday," she said. "Keep in mind we did not cancel it; we just postponed it. We can bring it up tomorrow if we wanted. So what we decided to do was just, because there was so much going on, let's just put on a temporary pause." Four Interior nominees await Senate committee action: three crucial assistant secretary positions and the position of Bureau of Reclamation commissioner. At least 11 other top Interior Department slots for which nominees must pass through the Senate Energy and Natural Resources Committee have yet to get a Trump administration nominee. In addition to the personnel needed to reinforce Zinke's short-handed team, the committee oversees some of the key elements of Trump's energy agenda. On top of chairing the authorizing committee that oversees Interior, Murkowski also chairs the Appropriations subcommittee that funds the department. Conservation groups and some lawmakers were critical of the administration's apparent attempt to intimidate the Alaska delegation. Rep. Raúl Grijalva, ranking member of the House Natural Resources Committee, said he was going to request an investigation into the alleged threats against the Alaska senators, calling the move "an alarming sign of how far the administration's ethical standards have fallen and how irresponsible the Interior Department has become." The Arizona Democrat has vehemently opposed many of the Alaska Republicans' policy positions, including an effort to build a road through the Izembek National Wildlife Refuge in the state. One of the arguments for constructing the 11-mile road connecting the towns of King Cove and Cold Bay in Alaska is to provide reliable medical access for residents. "Conditioning presidential support for Murkowski's bill to force a road through Alaska's Izembek National Wildlife Refuge on her support for Trumpcare is particularly ironic," Grijalva said. "Even if this road provides health care access to hundreds, which is very much in doubt, Secretary Zinke thinks the price to build it is a vote to deny health care access to millions." Grijalva also said Zinke's threats puts Murkowski's "clout in jeopardy" as head of the Energy and Natural Resources Committee, and "call into question which other lawmakers might face similar retribution." House Natural Resources Chairman Rob Bishop said this afternoon that he didn't know about the phone calls to the Alaska senators or what was said. But when a reporter explained the news to him, the Utah Republican said that kind of pressure is "not unprecedented." Environmental groups, including the Sierra Club, which disagree with Murkowski on many policy issues, such as opening drilling up in Alaska's Arctic National Wildlife Refuge, also weren't happy with the administration's allegedly strong-arming her. "Sen. Murkowski is a very serious legislator," said Athan Manuel, director of the land protection program at the Sierra Club. "We don't agree with her on some issues related to Alaska," he said, "but we respect her as a senator." Manuel added that he didn't believe the threat would work with her. Murkowski is "the complete opposite of the president" in that she is "sober and thoughtful on the issues," Manuel said. The threat against the Alaska senators just "highlights that he [Trump] doesn't understand anything about public lands" and that he views them as "a bargaining chip," he added. An official with another conservation group said his organization views the move as a short-term political tactic by the administration to influence Murkowski's vote on health care, not a permanent break in their alliance on the issues. "We view it as, once the [health care] debate is over, they will renew their energy dominance agenda together," he said. Jennifer Rokala, executive director of the Center for Western Priorities, was more colorful in her criticism of Zinke's phone call. "Ryan Zinke is revealing himself as Trump's hitman," she said in a statement. "He's now threatening to hold public lands and energy policy hostage over a health care bill." She added: "This is the U.S. government, not the Corleone family. Congress and the administration should discuss America's energy and lands policy on the merits, without mob-inspired threats from the Department of the Interior and the White House."